When you are in Rome, do as the Romans do... avoid carrying your wallet in the back pocket of your jeans. But no matter what city or country you are in, there are several easy precautions you can take to keep yourself as pickpocket-proof as possible so that your amazing travel memories won't be sullied by the experience of having your camera or passport stolen. Take the time to make yourself a decoy wallet. Use your money belt—just be sure not to take out your money belt, which defeats the purpose of having a concealed wallet beneath your clothes. Use basic common sense, such as not advertising your fancy video equipment or leaving things unattended. Last but not least, avoid thumbing through your dog-eared copy of Lonely Planet in crowded public places as much as possible. I know, easier said than done. 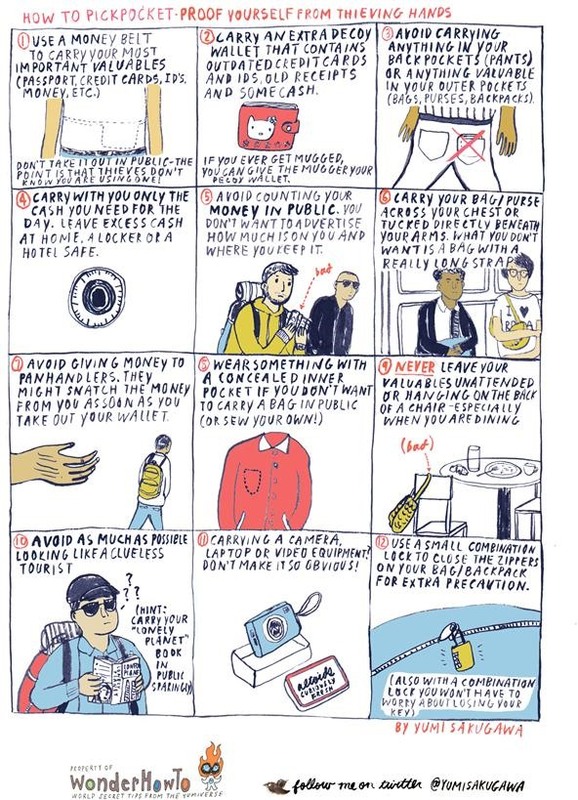 Got your own tips for avoiding pickpockets and thieves while traveling? Share with us in the comments below! It is a bit difficult to keep a REAL camera hidden like a DSLR. The photo quality is just beyond measure better with a real camera than a phone cam, compact digi cam + there is so much other benefits shooting with an DSLR. Also expect trouble and be prepared. scumbags never expect resistance. Except when they have a knife. Where I live in South America thieves won't hesitate to shoot or stab you if you resist. No possession is worth your life. also useful to button your pockets and sew buttons on them if they don't have them already. When I was in a tour group in Rome, some pickpockets cut the button off my friend's bag. However it was a fake button and she didn't lose anything - so if your bag zips up, sew on some buttons anyway to confuse thieves! Avoid looking like a tourist is one of the most wasted pieces of advice. Pick pockets target people in tourist areas no matter what they look like. Your presence in these areas make you target. I have seen seasoned travelers nicked. Your best protection is to be aware. Seasoned or not, I think looking like you know what you are doing and where you are going is never wasted advice. Perhaps I should have said avoid looking and acting like a clueless tourist to be more clear. I completely agree that awareness is your best protection. Also, in a crowded train, hold your bag like it's a baby. Don't let anybody get to it! Top and bottom - you don't want someone cutting it from underneath!